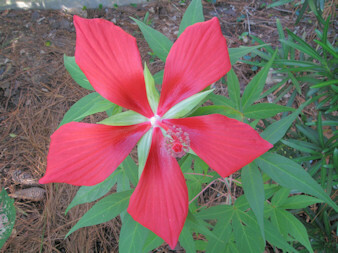 Hibiscus coccineus, commonly called Texas Star, Swamp Mallow or Scarlet Hibiscus is hardy to zone 7. It will die down in the winter, but return from the roots. This is not the typical tropical hibiscus which will not survive freezing temperatures. 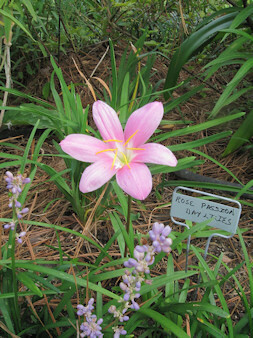 I first saw Texas Star in bloom several years ago while walking through the neighborhood. It took a little investigation before I found out what the name of that gorgeous flower was. Once I found out, I was on the lookout for that plant. The bloom on this hibiscus is a most striking scarlet. The flower is big, bold, and there is no way it can be overlooked. 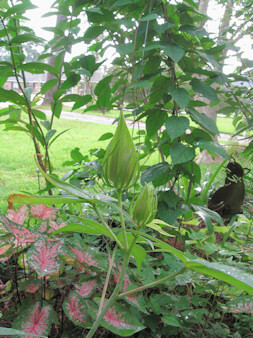 It starts out with a bud that looks like an ordinary hibiscus bud. But when it unfurls its eight inch scarlet flower, you realize this is no ordinary hibiscus. I bought one from a nursery, but have saved and planted seeds to have more. It grows very easily from seed. Growing to almost six feet, this plant likes full sun and moist soil. This tall, eye catching plant will look best at the back of the border. They start blooming in mid-summer and continue into fall. It is the vivid scarlet blooms that I love. Every year I wait for it to bloom and am so excited when that first red flower shows up. There is a white flowered plant, too, but even though I love white flowers, I’ll stick with the crimson ones. This is a native plant that grows all over the South. There is one down side to this plant – the leaves. At first glance, they resemble the leaves of the marijuana plant. I have read where a few gardeners have had to do some explaining to the local law enforcement officers. But if you really look at the leaves, you can tell that Texas Star is just a native plant with a beautiful flower, not an illegal one. Today was my second day of waiting to be selected for jury duty. I had to go Monday and today. Finally, after waiting and waiting, I was released without having been selected. It sure is tiring to just sit around all day. By the time I got home, I was exhausted. Since I was not home during the day to check on the garden, that job was left to dear hubby. He took the following picture of a visitor that was waiting for him to finish filling the bird feeders. 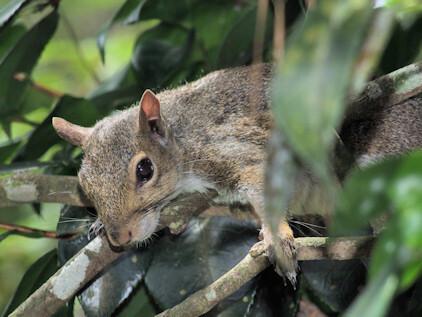 He said she was in the Camellia tree just waiting for him to go inside so she could attack the newly filled feeders. We only have about four to six squirrels now, whereas we used to have dozens. We think it is the loss of trees after Katrina that has kept the population of squirrels down. We have noticed the same thing about some of the birds that dwell in the tops of high pine trees. Since so many trees were lost three years ago, we do not see as many chickadees or titmice. But, back to the squirrels. We have had a love-hate relationship with them for years, ever since we put up bird feeders. Dear hubby is the one who really gets worked up when they wipe out the feeders. He has greased the feeder’s poles, put every kind of baffle there is on the feeders, and moved them innumerable times to try and prevent the squirrels from jumping on them. Needless to say, the squirrels win out eventually, though now, with fewer of them, it is not the problem it used to be. Even though they eat some of the food that is meant for the birds, we do enjoy their scampering about and chasing one another. Just like the birds and butterflies, they add a little more life to the garden. Just a few years ago, you couldn’t go anywhere without seeing purple fountain grass planted in containers or landscaping. It seemed as if it was every where. This year it does not seem as ubiquitous. However, I still have mine. It is a great summer plant. Mine are planted in containers that flank a trellis that opens to the side yard. The purple fountain grass gives just the right emphasis to that entrance to the side garden. I like that this grass can stand heat, high humidity and drought. All of these characteristics makes this a great plant for my southern garden. 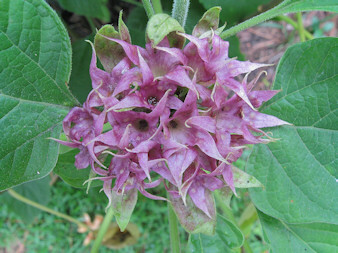 The purple inflorescences start to appear in mid summer and last through winter. Since mine are in containers and I live in a mild climate, come winter, I just bring them on the porch whenever a freeze is predicted since they are not hardy even here. In the fall, I usually plant purple violas in the containers at the base of the grass. This carries the containers through the winter. When spring comes, I just cut the foliage back to about three inches and soon new shoots appear. One year I had a piece of plectranthus break off, and I just stuck it in with the purple fountain grass. Before I knew it, the plectranthus (this really needs a common name) rooted and thrived. The undersides of its leaves echoed the burgundy blades and the combination worked well. Ever since then, I have grown them both in the same container. 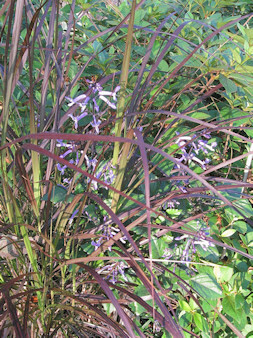 Purple fountain grass introduced the idea using ornamental grasses in the home garden to many people. 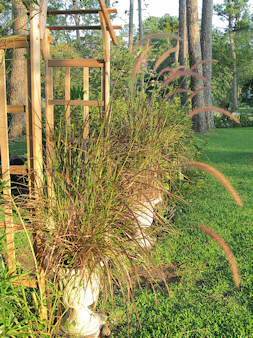 Now that more grasses are available, purple fountain grass is not used as much. I guess it was a victim of its own popularity. After almost two weeks of high temperatures and no rain, we have had five days of rain. It has been wonderful having cooler temperatures and not having to water every day. Some of the effects of this rainfall has been that everything in the garden has perked up and has had a growth spurt. Another effect has been the blooming of the rain lilies. I only had one or two blooms before the rain, but now, there seems to be a bloom every day. These little bulbs seem to bloom only after first being rained on. Watering with a hose just doesn’t seem to start them blooming. 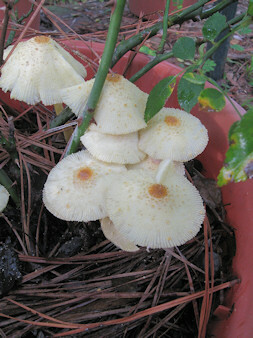 After a rain starts them off, then watering will induce blooms. Funny, huh? These sweet little flowers do brighten up a rain bedraggled flower bed. 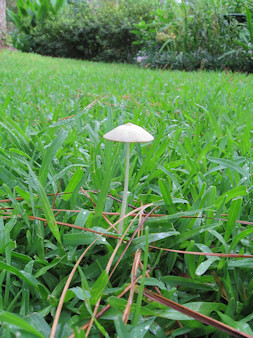 Mushrooms are another sign we have had a lot of rain, and many are showing up now. They seem to be where large trees were before Hurricane Katrina knocked them down. I guess some of the roots are only now decaying. Some showed up in a container of The Fairy rose. 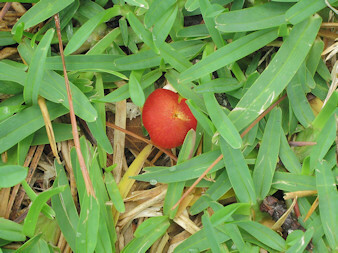 And, this tiny red mushroom showed up in the middle of the lawn. There have been many effects from having finally received rainfall, but the one I appreciate the most is not having to drag hoses around all day long. Thanks, Mother Nature. Last summer we bought a lime tree and harvested one lime. This year our yield has gone up 100%. Yes, that’s right two limes. We had plenty of blossoms this spring, and many did set fruit, but only two ended up surviving. Being that it is a small tree, it produced more flowers than it could support as fruit. 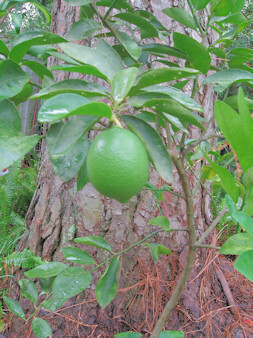 Citrus trees often take several years to bear more than just a few fruit. We have been growing satsumas successfully for several years and decided to give limes a try. Growing satsumas helped prepare us for what to expect from a young lime tree. Because of lime trees’ sensitivity to freezing temperatures, we are growing this one in a container. The plant is still small and easily brought inside on the few nights that we have a freeze. If it gets too big to bring inside, we will have to plant it on the south side of the house and hope for the best. But, I am sure that will be many years from now. We bought the lime tree with the intention of using them instead of lemons for iced tea (really good with limes), to have with an occasional beer, and, with our mint, for making mojitos. We have found the minty mojitos so refreshing in the summer. So, even though there are not enough limes to make mojitos, I can have a few glasses of gin and tonic with a twist of lime. Finally, some rain. We had a little rain band from Hurricane Dolly cross over us on Wednesday that dropped 1.25 inches. Thursday brought a small shower that reinforced that rain, and today we received .35. It is unreal how so many plants have had a growth spurt with the app. two inches of rain. We desperately needed that rain and are so thankful the dry spell seems to have ended. As I walked around the garden this morning to see how things were doing, I noticed the blue flowers on the blue daze, bog sage, and plumbago. It is a shame that there are so few true blue flowers to grow. When I first started gardening, I was disappointed many times when a flower that was described as being blue turned out to be a shade of purple. Why do they do this? Just say it is purple. The true blue flowers really stand out and can set off so many other colors. My favorite blue is the blue daze. 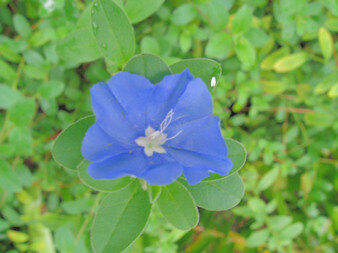 This plant is covered with bright blue flowers from early spring to early winter. It is only after a freeze that the blooms stop. Mine overwintered this year and started the spring growing bigger than ever. This easy-to-grow plant has small trumpet shaped flowers that open in the morning and close by late afternoon, but it is the color that really catches the eye. 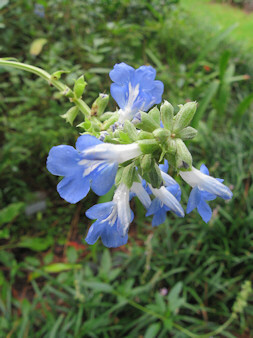 Another lovely blue flower is bog sage. This can grow quite tall and is supposed to be hardy to zone 6. I have had this sage about seven years now and look forward to its light blue color every spring. I do not think I have seen it in nurseries. I received mine from my daughter’s neighbor. Even though it is commonly called bog sage, it does need well drained soil. Deadheading will prolong the blooming of lovely, sky-blue flowers. 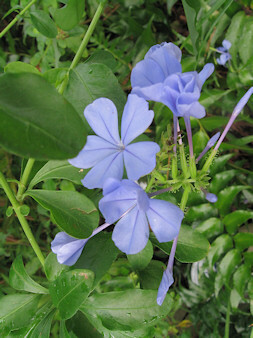 Many people have plumbago in their gardens. This plant deserves a large area to spread out. So often, I have seen people trimming it back to fit a small space and then wondering why there are hardly any blooms. It blooms on new wood, so any pruning should be done in early spring. There are many shades of blue for this plant, so it is recommended to buy it in bloom so you can get the exact color you want. Blue is a calming color and can help tone down some of the more vibrant colored flowers. Even on its own, true blue is striking in a garden. Maybe it is because of its rarity. 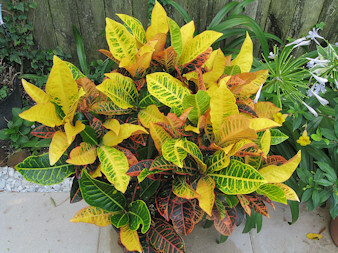 We all love color in the garden, and one plant that fills that requirement is the croton. 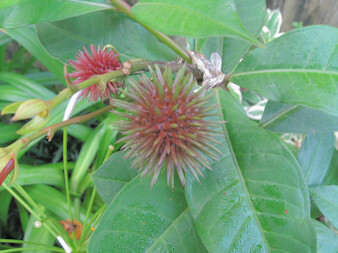 A popular foliage plant, most people use these to give a tropical feel to their summer gardens. I particularly like them as a fall container plant on the front porch. By October, when the rest of the garden is starting to go to sleep, these brightly colored plants with yellow, red, and orange leaves brightens and makes the area festive. Down here in the deep South, we really do not have fall color. Very few leaves on our trees change as they do farther north. We may have a few trees that turn a pale yellow, but we miss out on the mass of scarlets, golden yellows and other fall colors that is normally associated with autumn. For us, the croton is a colorful substitute for what we only see in pictures. This plant with its colorful, glossy leaves is a tropical. We grow it outdoors in the summer, but it must be brought indoors when the temperatures approach freezing. I have lost crotons when the temperature falls into the high 30’s, so now I bring them in whenever it is forcasted to be below 40 degrees. It makes a great houseplant next to a bright window in the winter or anytime. While this is a great tropical plant for the summer garden, I always showcase mine during the fall. When all those lucky people up north are enjoying the gorgeous color of the changing leaves, I, at least, will have the croton with its vibrant orange, burgundy, chartreuse, yellow, and green foliage. After the flowers fade, there often comes a surprise. After the flowers on the clerodendrum flagrans pleniflorum finished blooming, the remaining calyx hold on. They are a vibrant purple, and, at first glance, look like a flower. These remain a very long time, in fact, the ones pictured below are almost three weeks old. These were a deeper purple just a week ago but are now fading. Earlier, every time I went out to take a picture, it was too dark, so I do not have a pic of when it was the deep purple. Another clerodendrum I have, clerodendrum indicum, does the same thing except the remaining calyx are bright red. So, even after the flowers fade, there is still interest remaining on the shrub. The alamanda is also showing some interesting seed pods. I mentioned these in an earlier posting, and now they are turning a lovely shade of red-brown. The contrast of the green leaves, yellow flowers and seed pods adds the unusual to what could be just an ordinary container plant. So, as these plants show, there can be something interesting to look at after the flowers fade. Most of my hostas have finished blooming weeks ago. But the big chartreuse one in the front garden has just started flowering this week. 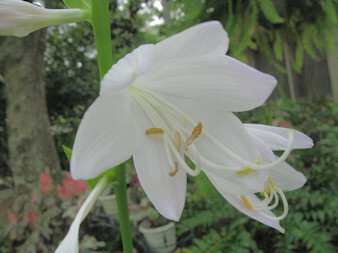 The flowers are large for hostas and are a pure white with a very pale lavender tinge on the outside. These particular hostas have done very well this year. In fact, one has grown so big that it will have to be moved. I made a mistake when I planted it too close to the edge of the bed. Last year it was fine, but this year it has grown too big for that space. I do not think I will divide it yet, just move it further back in the bed. I seem to have difficulty in visualizing how big plants eventually get. I always seem to plant things too close together, even when I know exactly how big they will grow. I want my garden to look lush and full, but I don’t want to keep moving things or trimming things back. Maybe I need to put some kind of object that would be the same size as the mature plant when planting to see how close things should be. I could use a bucket or trash can to help vizualize the eventual size. I am going to have to think of something. Am I the only one who has this problem of how far apart to place plants? 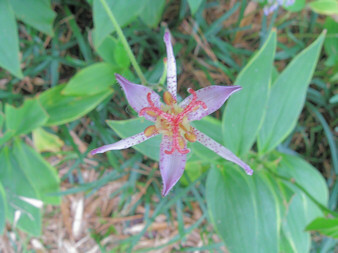 Toad lily (Tricyrtis formsana) is sending out blooms early. These flowers usually do not appear until fall. There are not that many showing up yet, but there are a few. I wonder if they are showing up early because of the dry weather we have been having. We are not usually this dry until late September or October with October being our driest month. We have only had 2.15 inches of rain this month which is less then half of what we usually have for the month of July. This is the only variety that is showing blooms. There are two varieties in the garden, and the other one, Tricyrtis hirta x miazaka, is not showing any signs of blooms. I have been deep watering the garden, but with no rain, I think some plants are beginning to think it is fall and are blooming extra early. There are some things to consider if growing toad lilies. These plants like a lot of shade. Mine only get about an hour of morning sun. The foliage will bleach out if they are in too much sun. They like a moist, fertile soil with plenty of humus. They like open shade and will grow anywhere from six to twelve inches tall with some two feet high. Plant them in the front of the border so that when in bloom they will be easily seen. The flowers are small, but prolific. I have mine in front of a bed of holly ferns. They do spread, but not invasively. The one that is blooming now is evergreen for me, while miazaka is not. I do not believe toad lilies are widely grown, but, for a fall blooming show, they can’t be beat. This lovely little lavender flower is like a little jewel in the garden.